Bloody Scotland, I Miss You! I’m not swearing, honest. It’s the name of the conference: Bloody Scotland. In Scotland, they sell more crime books than any other genre (even romance, which is the top seller in the United States). 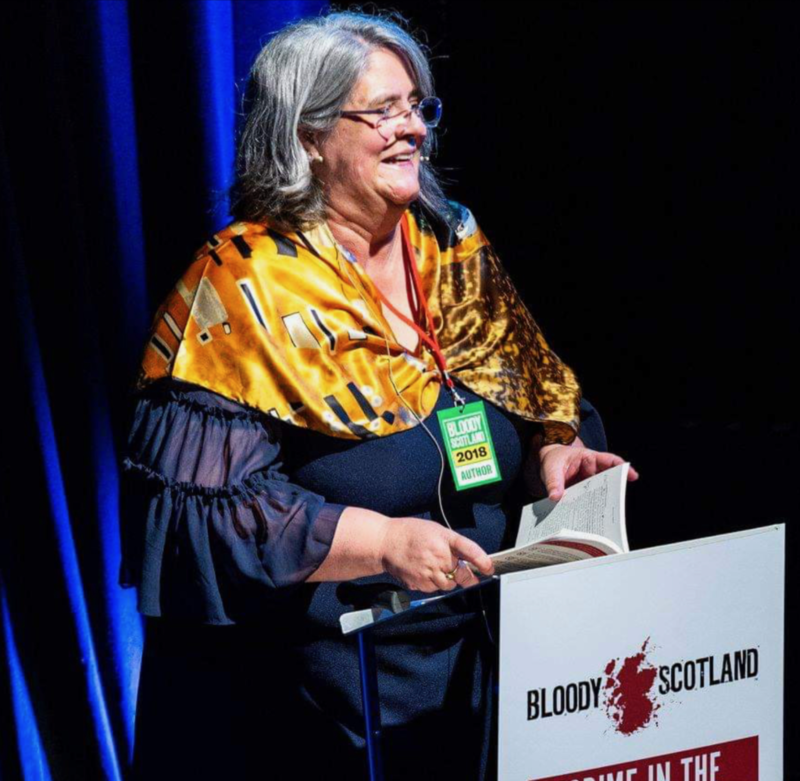 So it was my great honor to visit the Bloody Scotland conference in Stirling last September. They invited me to read as part of their “Crime in the Spotlight” program: entrants compete for a dozen slots to read for two minutes, before the big panels of the conference. Crime in the Spotlight writers are a sort of appetizer for the audience, and a great way for newer writers to gain confidence in front of audiences. Some things were very different at Bloody Scotland compared to American crime writing conferences, and some things were exactly the same. Conference organization: You pay about $10 for each panel, and a few events are free to the public. There’s no conference fee. This has the advantage of letting the conference organizers know for sure which events are the biggest draw, and which they can safely book in smaller venues. The disadvantage, obviously, is that the most popular talks sell out months in advance of the conference. Free coffee in a few places, but all meals were on the attendees, except for the master class (more about that in a minute). Conference location: The base of the conference is in the 250 year old Gold Lion Hotel, which once hosted Robert Burns. Talks are scattered between the hotel and the City of Stirling venues designed to hold 800 or so people. The conference provides a jitney to help disabled people get to the big hall and back, though if you don’t get lost like I did, it’s a short walk up a San Francisco-worthy hill. The conference does its best to accommodate people with disabilities, but it is a tougher job to get around in a wheel chair or with a cane than conferences that take place almost entirely in one hotel. That said, the hotel staff are funny and welcoming, the building is fascinating to any of us who were born and raised in California, where mid-century seems like old for a house. Stirling has a fascinating history as part of the sad life of Queen Mary, and its very own castle. The people I met in Stirling, from restaurant employees to hotel staff to the brilliant, hardworking folks who run Bloody Scotland were to a person kind, witty, and engaging. Some were more blasé about tourists than others. But I met half a dozen very talented writers and I look forward to staying in touch with them. Bloody Scotland was able to entice the long-lived and entertaining writer M.C. Beaton, wee lady whom you can believe delivered a “Glasgow Kiss” in her earlier years, and Ashley Jensen, star of the Agatha Raisin TV series based on Ms. Beaton’s books. Ms. Jensen and Ms. Beaton are sharp, smart women, and they regaled the audience well into the Saturday night. A few features are uniquely Scottish, like the incredible selection of whiskey in the hotel bar, and the satirical, Beyond-the-Fringe style revue that both celebrates and pokes fun at the traditional mystery. Also, I noticed that dark crime stories far outnumbered cozies and PI stories. Scotland, like its neighbors to the north in Scandinavia, embraces the dark side of fiction. Unique Events: Two unique features of this conference that other big conferences might consider adopting: Crime in the Spotlight and Pitch Perfect, a pitch-to-win competitive event. The Crime in the Spotlight crew gave us nervous newbies time to rehearse, coaching when our reading ran too long, and so much encouragement. Pitch Perfect is also a competition, you submit a pitch package, and they choose half a dozen of the applicants to give live pitches. The winner is introduced to a publisher. Previous winners have been published–this is no cattle-call as happens at other events. It’s a well-curated opportunity for the lucky winner. Some unique events I was unable to get tickets for: a raucous trivia game, and even more raucous soccer (rugby?) game, and a musical performance by some famous Scottish writers that literally sold out five minutes after the tickets were made available online. These events are rumored to be fantastic—though they did seem to give many people serious hangovers. And everyone’s favorite, a torch-lit march from the castle to the hotel, is something we can’t replicate here in America, being so short of castles. Multiple talks are scheduled at the same time and the conference had short turnaround times between panels, just like the bigger U.S. conferences. You have to be pretty good at scheduling to see your top five panels. (Of course, the PSWA conference ensures you access to all panels and events, but I think we are unique in offering only one panel at a time for a multi-day conference.) Writers, agents, publishers, and readers mingled in a friendly fashion, just like in the U.S.: conferences are a place where people can indulge their love of reading and writing, the world over. The day-long master class held the day before the conference was well worth the money, hitting both craft and marketing topics. Everything discussed was useful no matter in which country you plan to publish your work. I heard fantastic pitches, received great advice, and met some writers I hope to stay in touch with. Another similarity—the conference organizers ran themselves ragged to ensure each attendee had a great time. So whichever conference you go to, don’t forget to compliment people when things go well, and of course let someone know if you aren’t having a great time. But I try to be gentle, as I know anyone I talk to is sleep-deprived and exhausted from all the work they do. People are at the conference to share and learn. I was a very quiet version of myself at the conference, wanting to soak it all in and learn as much as possible. I swapped business cards with half a dozen people, and came home exhausted but happy I’d gone. If you can afford it, and if you are already interested in the location where the conference is taking place, it really is a grand adventure to talk about mystery, crime, suspense, and forensics with people from another country. Theakston Old Peculier Crime Writing Festival, Harrogate, UK (near the Yorkshire Dales National Park): This year, Val McDermid and Scotland’s leader, the amazing Nicola Sturgeon, are guests. If you do go, try to take as much extra time as possible. There’s so much to see in Scotland, and despite the dour stock characters you may have seen on television’s Midsomer Murders, the Scots I met were to a person kind, welcoming, witty, genuine, and knowledgable about writing and the wide world. A true joy to visit. Bloody Scotland, Here I Come! John Tolley on Bloody Scotland, Here I Come!